Microsoft this week bumped up its claim of Windows 10 devices to 75 million when a company executive tweeted that figure. "More than 75 million devices running Windows 10 -- and growing every day," Yusuf Mehdi, corporate vice president of Microsoft's Windows and Devices division, said on Twitter. Mehdi had last updated the official Windows 10 tally on July 30, when he said 14 million devices were running the new OS. Microsoft began triggering on-screen Windows 10 upgrade notifications on PCs running Windows 7 and 8.1 on July 29. While the 75 million cannot be independently verified -- Microsoft is likely citing the number of Windows 10 "activations," the check-in the OS does with Redmond's servers when it's first run to verify that it is linked with a valid product key -- it is in the ballpark of third-party estimates. Data provided to Computerworld earlier this month by analytics vendor Net Applications showed that by its calculations 3% of all Windows-powered personal computers ran Windows 10 during the week of Aug. 2-8. That 3% translated into approximately 45 million devices, assuming there are 1.5 billion Windows systems worldwide, the latter number one that Microsoft itself has repeatedly used. Another analytics vendor, Dublin-based StatCounter, which tracks a different metric, has posted data that also appears to dovetails with Microsoft's 75-million device claim. The growth of StatCounter's usage share for Windows 10 -- a measurement of Internet activity -- since July 30 closely matches the increase Microsoft claimed. The growth rate from 14 million to 75 million -- Mehdi's numbers -- represented a very strong 436%, give or take a decimal point. Likewise, growth in StatCounter's Windows 10 usage share from the 1.34% on July 30 (when Mehdi touted 14 million near day's end) to the high water mark of 7.26% on Sunday, Aug. 23, was an almost-the-same 441%. Microsoft's 75 million was significantly larger than similar boasts in 2012 -- and earlier, compared to how fast previous Windows' editions left the gate. That's not a shock; everyone has expected a stronger uptake because Windows 10 is a free upgrade. Prior Windows editions were not. In 2012, for example, Microsoft said it took Windows 8 a month to crack the 40-million-licenses-sold mark. In 2010, a little more than four months after Windows 7 debuted, the developer said 90 million licenses of that OS had been sold. StatCounter's data supports the idea that Windows 10's start has been a record-setter for Microsoft. 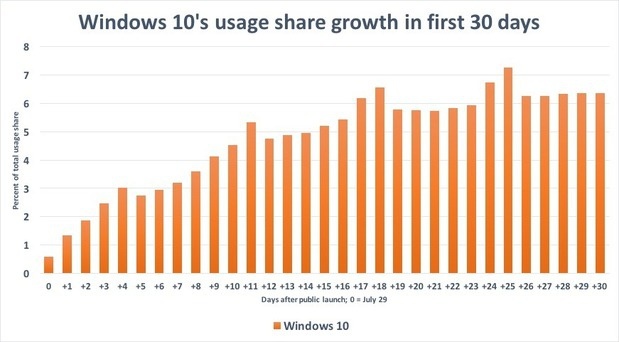 Windows 10's usage share after 30 days, for instance, was 37% higher than that of Windows 7 after its first 30 days of availability. Microsoft has set a goal of putting Windows 10 on 1 billion devices within three years: The 75 million represents 7.5% of that target. Windows 10 usage growth has settled into a pattern the last two weeks, with the steepest gains on the weekends.